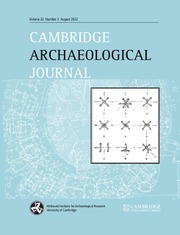 The Cambridge Archaeological Journal is one of the leading international journals for symbolic, social and cognitive archaeology. It provides a forum for innovative, descriptive and theoretical archaeological research. Specific topics span all archaeological ideas, regions and periods. In addition to major articles and shorter notes, the Cambridge Archaeological Journal includes book reviews and review features on significant recent books. The Journal has a distinguished editorial board including scholars of international repute.